So, here's a rhetorical question…Is it possible to have too many pillows? We all know the answer is, “Of course not, silly”. With very little work or supplies, you can have a lovely new decorative item for your home. Kate came home for her summer break (which was all of 5 days) 2 weeks ago. We had a lovely, though very short time, with her and somehow it came up in the conversation that sofa in their apartment could really use some pillows. This was a very fortuitous pronouncement as Terry had just diagnosed me with ‘a pillow problem'. Somehow in his distorted view of the world, he thinks that the 9 pillows on our bed is 7 pillows too many!! I surely don't get it…but in any event, I was able to use 2 of the pillows that were up in the attic to make these pillows for Kate, thereby reducing the stash that seems to cause him issues. Do you remember this painting I did for their apartment this past fall? 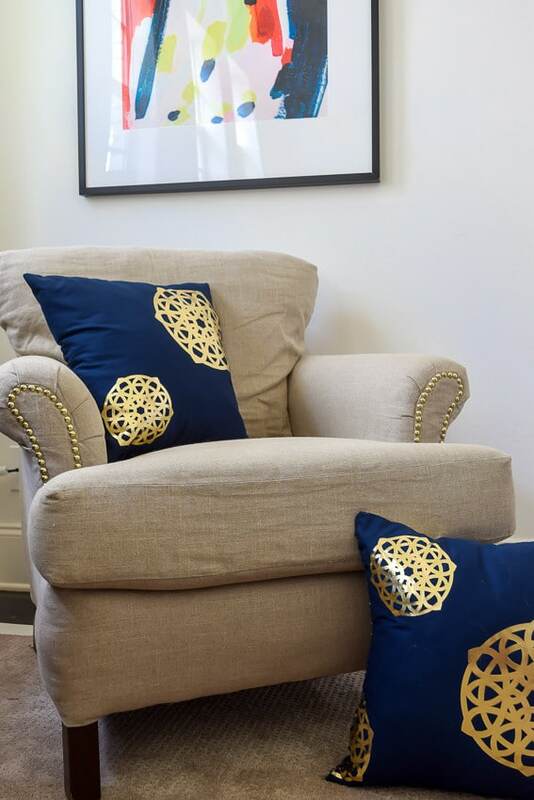 Well, Kate and her roommate wanted to stay with the blue/gold feel for these pillows too. N&N Pro Tip: When using the Cricut Iron On Foil, put the good side (the side you want to show, in this case, the gold foil) FACE DOWN on the mat. Anywho…once I figured out the right way to cut the Iron-On Foil, this project was easy, fun and more importantly, was just what the girls wanted for their apartment. I used Paper Lace 2 in Cricut Access (#M3BF26) for the medallion and cut it in several different sizes. A standard grip mat worked perfectly. For each pillow, I cut at least one medallion in half…I like the look of them being half on and half off the pillow. Ironing on the foil was super easy. If, when you peel the clear liner off a wee bit of the foil wants to pull up, then stop and iron the decal again, making sure the liner is between the iron and the decal. I've got to honestly admit that the Cricut is really opening up crafting and making opportunities and my mind is always working on new Cricut possibilities. Here's a little video just showing the weeding of the medallion and peeling off the liner. No rocket science here, but just to show you how easy it is. I sewed the three sides of the pillow with my machine, filled it and then hand-stitched the fourth side closed. So, I'm getting ready to put these pillows in the mail and send them to my sweet girl and her sweet roomie. AND THEN…I will have 2 fewer pillows in my home, so Terry can't say anything about my ‘pillow problem' anymore…as if it were a real thing anyway! Thanks so much for stopping by to visit today; I appreciate it more than you’ll ever know. If you want to see what I’m up to from week to week, sign up here to sign up for updates. Thank you for sharing your fun pillow tutorial. They turned out beautifully. It is no wonder you and I connect…I have the same “issue” with pillows myself. During our recent move, even the movers gave me a bit of a hard time over the number of extra pillows I had conveniently stored in the basement. Keep treading water my friend, smoother seas are just up ahead! Hey there friend…how’s the move? And I have always know you and I were brilliant…just waiting for our husbands (and movers) to figure it out. You are so right…we all hit bumpy seas from time to time…and this too shall pass. The pillows look wonderful. I have an older version of the cricut (uses only cartridges not design space) that I had used mostly for scrapbooking when my kids were younger. I recently pulled it out again and have been having a great time exploring new crafting options to use it for. I am falling in love with the machine and what it can do all over again and recently used some of the iron on vinyl to create some new pillows as well. Thanks for sharing the look you obtained with the foil. Wishing you smoother times in the rest of life ahead. Hang in there. Hi Dorene and thanks for your kind comments. We all have bumpy times…it’s just my time! I am still new to my Cricut and like you having a fun time figuring out how far I can push it. I’m not familiar with the cartridges but would imagine you still have some great design options. Very much appreciate you stopping by. Thanks Maureen…this too shall pass. Those pillows! That painting! What a talent you have for creating beauty, Lynn. I hope your trying times end soon. We, your readers, will still be here when your life allows for more energy for blogging. I 100% get it having been in a similar place recently. Hey Robin, thanks for stopping by. I am having a ball with that Cricut and I always have fun when I have the chance to put paint to canvas. And I know that you know that life has a way of keeping you on your toes…helps you keep everything in perspective. Thanks for your kind and encouraging words. Oh Lynn! What an inspiring first part of your post! I encourage to be kind all the time to my kids and my family! I hope that all settles for you soon!! Your pillows turned out magnificent!!! I love the pattern and they match your beautiful artwork perfectly! Your daughter and flatmate must be totally thrilled!! Hey Sam, thanks for your kind words and it life is settling back down, thanks. I’m waiting to hear from my daughter…think she is hoping to get them from the post office today. Thanks for coming by friend. 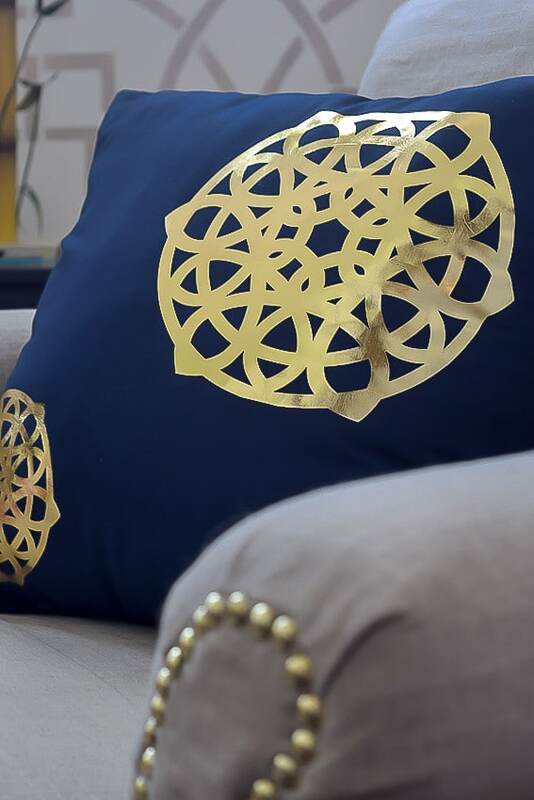 That gold foil is beautiful on the blue pillow! I love the design you choose too, it is so modern! Aw thanks Mary, blue and gold is such a lovely combination…especially that great metallic gold. And I’m really please with how it turned out…not sure my daughter has picked them up from the post office yet though!